23 days until the London Marathon. I ran for 5:33 this week. 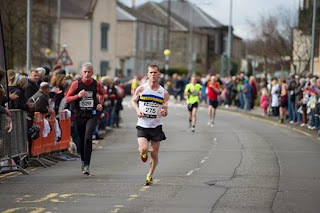 I had to pee with 10 minutes to go to the start of the Alloa half marathon. I made my way through the crowd, back to the recreation centre that served as the headquarters for the race, and took care of business. By the time I returned to the starting line, it was jammed with over 1500 runners. I tried to weave my way as far forward as possible, but eventually came to a standstill. The gun went, and we started a slow jog to the start line. Mile 1 was flat, and came in at 6:47. This was fast, and I wanted to dial it back a bit. My ambition was to break 1:30, which would be a personal best. I had the miles in my legs, but did I have the speed? My timing chip came loose in mile 2. One of the plastic ties was undone, and the other was loose. There was nothing for it but to pull off onto the sidewalk and fix it. I tried to tighten the tie, but it didn't seem to bite. Then I tucked the chip into my shoelaces. Runners streamed past. Eventually I just started to run, and almost immediately the chip came out of the shoelaces. It flopped against my shoe with the one remaining tie. I thought I'd just keep an eye on it until it fell off, and then carry it the rest of the race. Mile 2, with the stop, was 7:46. 3 had a slight climb, and was 7:05. 4 had some descent, and was 6:51. 5, with a real descent, was 6:33. Though I was in shorts and a vest, when the sun was out I warmed quickly and sweated. The middle miles of the race were into the teeth of a strong wind. For 6 and 7 I stuck with a guy who was picking people off, and they came in at 7:01 and 6:56, respectively. The guy pulled ahead a bit, and for 8 and 9 I faced the wind on my own mostly. These came in at 7:11 and 7:04. Mile 10 came out of the wind, but featured a good climb. It came in at 7:15. The end was nearing, and I caught G., a friend from the running club. 11 was 7:19, again with some climbing. I knew that the rest of the race was largely downhill, and so I tried to pick up the pace. In the final turn, I kicked, and caught another runner just before the finish line. And then I was done. 1:31:33 all in. It wasn't a p.b., but I thought I'd run well, considering the wind and my stopping for my chip. My finishing time was only about 45 seconds off my p.b., and I'd finished strong.